Shoo-eee. 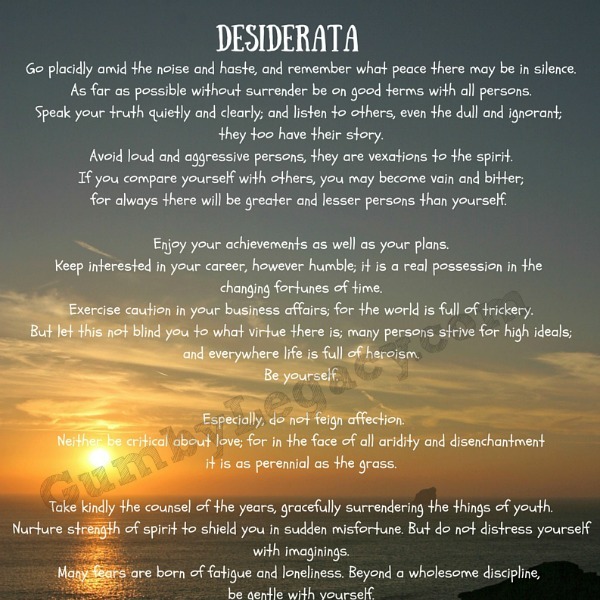 I just finished designing the Desiderata poem poster that you can have access to after signing up for our Gumby Legacy Newsletter and I thought I’d quickly look up the history of Desiderata to see how it came about. This poem has been a favourite of the family’s for many years and was particularly special to Gumby who would often quote it. I expected a brief little history but turns out, it’s all actually quite complicated! This website seems pretty convinced that their story is the correct one but there’s quite a bit of speculation as to the exact origins….. Apparently Max Ehrmann was a poet and lawyer from Terre Haute, Indiana and he wrote Desiderata in 1927. Desiderata means “things that are desired” and it is said that Max wrote it for himself “because it counsels those virtues I felt most in need of”. It became popular in the late 60’s and early 70’s and the wisdom seems to have been passed down through the years. Not surprising at all really. After all, the words are beautiful and imply that if you follow these simple virtues and values, you shall live a wonderful, peaceful and happy life, loving many and loved by all! There is however some confusion about the poems origin with many believing that it was written by an anonymous author in 1692 and was found in Old Saint Paul’s Church. The reason for the confusion is because a Rev. Frederick Ward Kates who was rector of the church from 1956 to 1961 used Desiderata in a booklet that he gave to his parishioners to read. On this booklet was the church’s name and the year it was founded: ‘Old Saint Paul’s Church, Baltimore, 1962’. Since then, the two have been linked together and successful in confusing many about the real history of the poem! Something else I thought really interesting is how the poem ends. It is thought that the original poem said “Be cheerful” but this was changed to “Be careful” which is generally agreed to be “not in the spirit” of Max Ehrmann’s writings. I much prefer be cheerful and have put this in a high quality, printable Desiderata poster which you can download here. If you’re fascinated (! ), there’s a bit more about the copyright history of Desiderata which you can read about here . I hope you found this interesting and will now sign up for your own copy of Desiderata to put up and be inspired to live your life by!